The Range Rover is such a masterfully executed SUV that I have no shame sharing pictures of it any chance I get. Yesterday, June 17 2015, was the 45th anniversary of when it was introduced to the world. Here are some highlights from the vehicle’s history. 45 years of history is a lot to stuff into a tight commercial spot, but this clip hits a few of the SUV’s best accolades. Come on, that thing’s gotta be pretty enough to distract you from reliability records and residual value. Which, as Land Rover would be keen to point out, are improving! 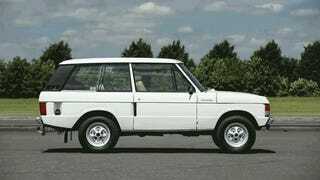 1974 – Range Rover completes west to east Sahara desert expedition - 7,500 miles in 100 days. 2015 – Range Rover SV Autobiography launched at New York International Auto Show. Every iteration of this thing looks awesome in “stormtrooper,” so here are the rest of the family photos for your private-time enjoyment.